There are a great many things to love about living in New Albany, IN. From thrilling college games at Indiana University Southeast to classic artwork at the Carnegie Center for Art & History, living here means finding something for everyone. One thing that may be in short supply is dependable lawn care services. Many companies are expensive and only provide basic services like grass cutting. Finding a complete lawn care company doesn’t have to be a struggle. You can always rely on Lawn Works for your best landscaping services. 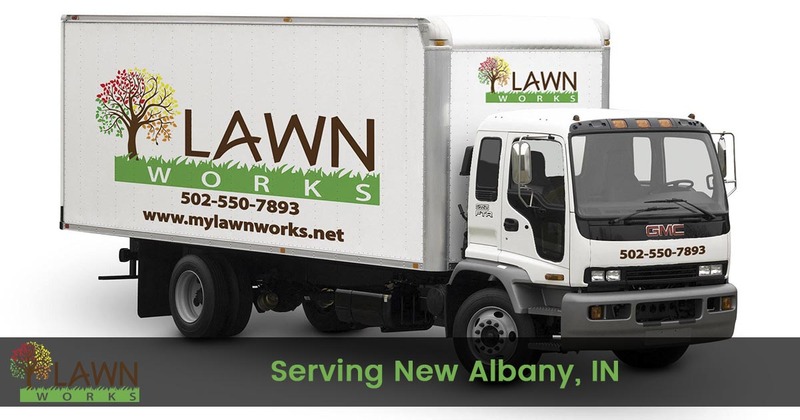 Our team has been servicing the greater New Albany area since 2015. Whenever you need a company that has experience and affordable pricing, there’s no one better for your home than us. And many more choices for your best lawn. We offer everything that you need to keep your home looking its best all year round. From better grass cutting to winter-specific services, we do it all for less each time! Call us today to schedule your best lawn maintenance provider. Let us help you achieve the yard you’ve always wanted! Whatever your home needs to look fuller and greener, our local lawn care experts can handle it. We do it all, from regular yard cutting and weed control to total backyard redesigns. Attempting to complete all your outdoor chores by yourself will soon have you exhausted. And buying all your lawn care supplies at a retail store adds up fast! Instead, we have everything needed for the perfect green space each time. Our team has all the right tools, equipment, and weed and pest control products you can trust for better results. Before you spend a fortune on chemicals and waste more time each week with your outdoor areas, call the company that only offers the best in landscaping services. We’re ready to make your yard into an outdoor oasis! If you are unsure about giving your grass and plants certain additives, then you may accidentally cause them harm rather than help them grow better. Even products meant to assist plant growth can have the opposite effect if not used correctly. Despite their sturdiness, it doesn’t take much to send trees and flowers into shock. They may appear healthy one moment and then be drooping and yellowed the next. Instead, a professional landscaping professional can achieve better results, often without relying on toxic chemicals. By offering more natural approaches and personalized care, we make your yard look its best on each visit. Our company isn’t concerned with forcing you into services that won’t benefit your yard. When you hire us, we only provide what’s in your home’s best interests. If you can’t seem to find a trustworthy lawn care company you can afford, then look no further than us. Call now to discover how we can save you more on a professionally manicured lawn!